What happens when a Mother-to-be goes into unexpected labor? It’s Armstrong (and Dad! ), to the rescue! Over the summer, Communications Manager, Jeff Scott, stepped in and talked a father through the delivery of his son over the phone before first responders could arrive. 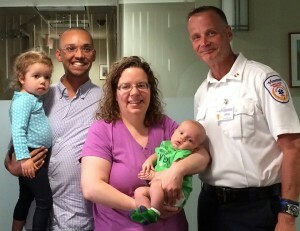 Now, fast forward to “The reunion” when baby K and his older sister came to visit our headquarters. The family was presented with some small tokens including an “Armstrong Ambulance Special Delivery” onesie. Baby K may have fallen asleep, but Mom and Dad had a great time learning the inner workings of Dispatch. Jeff received some well-deserved praise and thanks from the family who were grateful for his help in bringing their newest addition into the world!